If you are using a SodaStream soda maker or the KitchenAid Sparkling Beverage Maker, you will have to use SodaStream’s refill system. While this isn’t necessarily a bad thing, it does make you dependent on them and restrict’s your freedom of choice. The exchange process is straightforward. Simply head to a participating retailer with your empty carbonator and exchange it for a full one at the cost of $14.99 for the 60L carbonator or $29.99 for the 130L carbonator. There are thousands of these retailers around that can refill or exchange your empty CO2 bottles. To find a location near you. If you are planning on using the 130L carbonator, make sure to check if the store accepts them since this isn’t always the case. You can also buy additional carbonators to make your exchange trips more efficient. While this system is undoubtedly more convenient than having to constantly go to the grocery store to buy additional bottles of club soda, the convenience comes with a premium price. The $29.99 you pay to exchange your empty carbonator is attributed to the cost of the gas contents. It is however possible to buy the same quantity of CO2 at a fraction of the price. 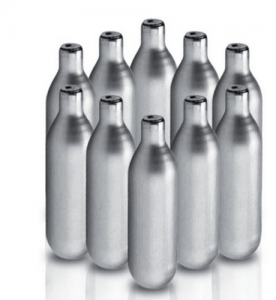 For almost all other soda makers and soda siphons (iSi, Mastrad, Soda Plus, etc.) you need to use CO2 cartridges instead of carbonators. There are many companies that offer food grade cartridges that will fit into most soda makers. However, be warned that some siphons only accept their brand of cartridges. For the other brands, the CO2 cartridges can be bought in bulk online for very cheap which allows you to create delicious seltzer water for as low as 30 cents/liter. It can also be more convenient since the chargers (cartridges) are sent directly to you and you don’t need to go to a store to refill your carbonator. Before buying them, check on this website to find if your soda siphon accepts all CO2 cartridge brands. 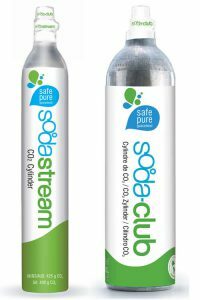 The different brands of CO2 cartridges are very similar and the Soda Maker Club recommends buying whichever is cheaper. Bonne O, being a new company, has come up with an innovative new refill system. 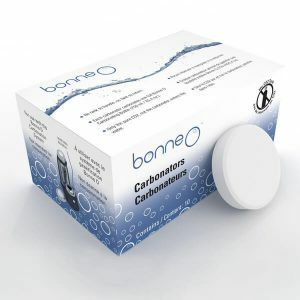 Instead of using carbonator cylinders or cartridges, they sell round food grade carbonator tablets that you put in the soda maker to carbonate your drinks. These are relatively expensive costing 50 cents each and each one can only carbonate one Bonne O water bottle (750 ml). Nonetheless, it creates no physical waste. 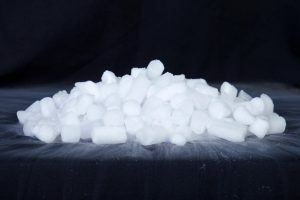 It is possible to slightly modify your SodaStream carbonators in such a way that they can be refilled with dry ice, a paintball tank or a separate CO2 tank. These 3 methods can be seen on this page. To see the savings of refilling your SodaStream Carbonator by yourself.